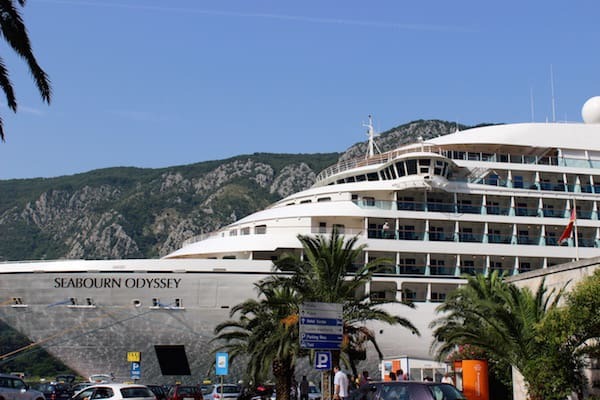 sailing Seabourn Odyssey from Venice to Athens. Within the span of an hour, we traveled through centuries, leaving the 14th century opulence of Hotel Danieli to board the sleek, clean-lined Seabourn Odyssey, a 450-passenger, all-suite ship built in 2009. Our first cruise with Seabourn, the seven-day Adriatic and Greek Isles cruise from Venice to Athens, seemed perfect to celebrate the 25th wedding anniversary of my sister and her husband. The experience was made even more perfect because we were upgraded from our Penthouse Suites to Owner’s Suites and boarded eagerly, awaiting the big reveal. At 526-square feet, the Owner’s Suites are larger than most hotel rooms. Located at the most forward part of the ship, our well-appointed suite was cheerfully decorated in neutrals with burgundy accents for a pop of color. A stunning orchid arrangement, chilled bucket of champagne, fruit platter and canapés were set out to welcome us. The spacious main room included a dining table for four, a comfortable chaise sofa with a flat screen TV, and a half bath conveniently located next to the fully stocked in-suite wet bar and pantry. French doors led to a separate room with queen-sized bed, another flat screen TV, and granite bathroom with double sink, separate bath and shower, and a walk-in closet with built-in drawers to die for. The jaw-dropping wrap-around wood balcony with rattan loungers, armchairs and tables provided additional living space and a superb vantage point for gazing at the ever-changing scenery. Relaxing on the balcony while sipping tea and coffee, my husband Tom and I had front row seats to our morning sail into the stunning Bay of Kotor in Montenegro, threading its way through the fjord-like steep green cliffs, past Venetian fortifications to the medieval town, a UNESCO world heritage site. As two-time cruisers with another luxury line, we were unsure what to expect onboard Seabourn. Having read the accolades, we anticipated an upscale, all-inclusive, small ship cruising experience with superb dining and service. Yet Seabourn’s reputation for a more casual environment that attracted younger crowds worried us. Our vision of a serene, blue-water Mediterranean cruise did not include crying babies or blaring music on the pool deck, or relentless loudspeaker broadcasts of deck activities. Our fears dissipated that first evening. Seabourn’s atmosphere of casual elegance simply meant less formal, not any less refined. Think fine dining without the highbrow service; sophistication without the stuffiness. The dress code most evenings was designated as Elegant Casual or Resort Casual. Particularly for shorter itineraries with one formal optional night, it’s hardly worth packing a tuxedo and dress shoes. Slacks and a jacket will do nicely for gentlemen; a blouse with a skirt or slacks or a cocktail dress is fine for ladies. Yes, there were plenty of affluent boomers onboard but hardly any babies. As for loudspeaker announcements, we wound up looking forward each day to the pleasant greetings and infectious enthusiasm of Ms. Sophie Tehrani, our Cruise Director. The public areas of the ship strike a comfortable balance between quiet, personal space and inviting social spaces to meet and mingle with new friends. With open bars throughout the ship and fine wines poured at lunch and dinner, Tom and I easily adapted to this more approachable style of pampered luxury. While onboard, I spoke with the Captain, David Bathgate, to better understand Seabourn’s business model. Born in 1963 near Edinburgh, the Captain fit in perfectly with Seabourn’s affinity for attracting a younger clientele. He rose quickly through the marine ranks and attained his first command at the age of 35. According to Bathgate, unlike many cruise companies who hire through agencies, Seabourn employs most of their crew. Consequently employees have pride as part of the team, co-ownership of the product, and routinely exceed guest expectations. Indeed we found the crew to be remarkably intuitive, practically clairvoyant and genuinely eager to please at every turn. Bathgate added, “One of the key attractions is the size of the ship and the ratio of passengers to crew. There is almost a one-to-one guest-crew ratio that provides for a certain intimacy that works very well and is very popular with Seabourn’s guests.” With only 229 ocean view suites and its 450-guest capacity, passengers get looked after pretty darn well. Bathgate also discussed the personality of the ship, noting that the layout and style make it feel very personable. Indeed, within the first few hours onboard, I felt surprisingly at home. The variety of restaurant choices, and the mix of bars, lounges, and entertainment along with its light and fresh décor give the ship an inviting, contemporary vibe. The Odyssey has four outstanding dining venues, each with its own distinctive menu, and all day in-suite dining. Most venues are open seating and reservations are required only in the smallest restaurant, Restaurant 2, offering tasting menus. At The Restaurant, we indulged in gourmet dining that rivaled many four star restaurants. Chef de Cuisine Martin Kitzing enjoys creating local dishes and looks for something that fits in with the place the ship is sailing. His signature dish: Pecorino cream cheese ravioli with olives and Prosecco sauce. The Colonnade is an airy indoor-outdoor casual venue with hot and cold food stations featuring rotating culinary themes. We sampled Old English, Indian and Thai themes during the week. While Old English food sounded off-putting to me, I’m still dreaming of the Pan Fried Dover Sole we devoured at lunch. The Patio Grill is a convenient, inviting poolside location for a casual lunch or dinner, and of course, cocktails. The Seabourn Square coffee bar serving cookies, cake pastries, gelato and finger sandwiches is the preferred haven for Starbucks-deprived guests in need of a pick-me-up. Entertainment options after dinner included piano music in the Observation Bar and more lively band music and dancing at The Club. Befitting its atmosphere of casual elegance, we relaxed on the Patio Bar listening to beautiful guitar music under the sky. While the cuisine is undoubtedly the star attraction, the award-winning spa is a close second. The two-deck health spa and salon, with hydro pool and heated loungers is the ultimate way to wind down after a day of sightseeing. Right next to the spa is a fully equipped, ocean-view gym with complimentary yoga and Pilates classes should you feel the need to work off Chef Martin’s delights. As part of Seabourn’s Conversation program, guests get to share their passions with luminaries from the arts, sciences, history and current affairs and engage in learning experiences with fellow passengers. While our husbands soaked up historical lectures previewing the next day’s port, my sister and I would settle in for afternoon tea or cocktails at the Observation Bar. The line offers a variety of shore excursions including both group and private tours with a range of styles (motor coaches, boats and private cars and minivans) and levels of difficulty (easy, moderate and considerable walking). In addition to general interest tours, Seabourn features epicurean and adventure collection tours such as exploring Corfu by mountain bike or 4×4 self drive vehicles. Tours generally depart early around 8:30am and last from 3-7 hours. As part of its alliance with UNESCO to help protect World Heritage sites, Seabourn invites speakers with special knowledge onboard to offer guests deeper insights about World Heritage sites. Hands down, the Seabourn Signature Epicurean poolside party was the most fun event of the week. We joined fellow guests and ship officers for caviar with some tasty morsels and Ouzo. Later that evening we enjoyed a hilarious comedy show called the Liar’s Club where the audience is invited to figure out who among the professional panelists of liars is telling the truth or a pack of lies. The week sailed by without enough time to try many of the activities onboard, such as complimentary kayaking, pedal-boating and water skiing from the back of the ship on Marina Day; shopping with Chef Martin; social bridge, golf putting contests, Jive and Zumba classes; and the Big Screen Popcorn Movie night. A week’s time was just not enough. Newly converted to Seabourn’s relaxed style of luxury, we departed wanting another, longer adventure. Can’t wait. Maureen Hudson is a retired corporate lawyer living in the San Diego area with her husband Tom, also retired, and their sweet Dalmatian Abby. Now that she has more time to travel, she hopes to combine her love of writing with her love of traveling. Disclosure: The author received complimentary upgrades from paid Penthouse Suites to Owner’s Suites but any opinions expressed in this post are her own. Maureen sure returned “wowed”! I had a wonderful trip on Seabourn’s Spirit years ago. It’s a great line! A very interesting read. When we sailed on Azamara last year, there were some Seabourn refugees who said they found the Seabourn “crowd” too old. Mind you, these refugees were not spring chickens themselves. Maybe some day I’ll have the opportunity to do the comparison myself. Very often, the demographic mix is also a matter of the itinerary and timing, don’t you think? I haven’t noticed huge age differences on ocean-going vessels. It seems one of the big benefits of ocean or river cruising is the lectures. I would be all about the historical and cultural lectures. Seabourn is classy as it is. Sailing in the owner’s suite must have been quite something!The really nice thing about cruising on the “six-star” lines are the inclusions – complimentary wines, water activities, often excursions. Glad you enjoyed your trip!